A lot of people are drawn to copper cookware simply because of the look. But did you know that copper conducts heat better than any other piece of cookware? That’s right. Better than your grandma’s old cast iron skillet. Better than that stainless steel pan or that ceramic Dutch oven. Professional chefs have known this for a long time. Luckily, many companies have figured this out, as well as figured out a way to offer an affordable copper cookware set to home cook enthusiasts. So getting an entire set of copper cookware is a great way to go. But which one do you choose? 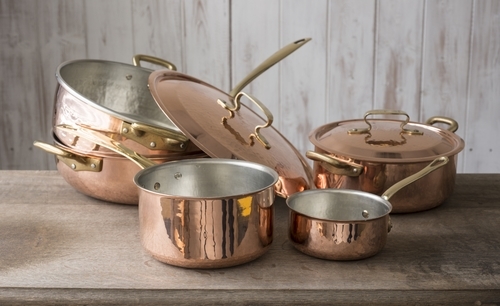 Let’s take a look at some of the best copper cookware sets out there on the market today. Some are great for those just getting started while others are good enough to be used by professionals and look nice enough to put in a museum! What Type of Cookware Should I Get? If you are wondering why copper cookware is so great the answer is simple: it heats up quickly and cooks evenly. Copper conducts heat quickly and there is no such thing as “hot spots” with a copper pan. Copper also tends to be a bit heavier which means pans will be stable on the burners. 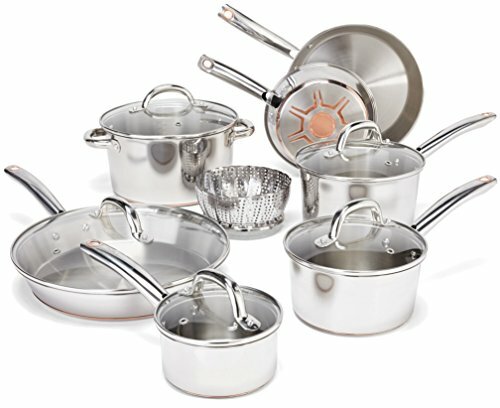 When looking for any type of cookware, it’s good to look for pots and pans that are heavier to prevent any accidents. And of course, another benefit to copper cookware is the way it looks. Copper cookware is sure to draw attention. Choose between smooth shiny copper or a rustic hammered look. When looking for copper cookware, look for a thicker copper layer. Thicker coating means a heavier more stable pan. A thinner layer of copper will wear down over time, exposing the stainless steel underneath. The look of a solid copper pan or pot is eye-catching. And since it is great for cooking, why wouldn’t you want to get a solid (also known as bare) copper pan? The biggest reason why getting a lined copper pan is a good choice is that bare copper can react to certain acidic foods such as tomatoes, citrus and the like. So no making marinara in a solid copper saucepan! As long as you stick to non-reactive foods, then bare copper pans would be fine. However, the only other thing to be aware of is that copper from copper cookware can leach into foods, which means over time you ingest that copper. Copper is something we do need in our bodies, but too much copper in our body can be a bad thing. 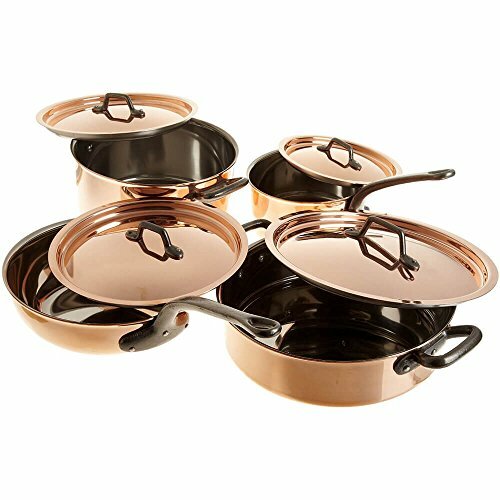 For something more versatile, easy to use and clean, consider getting a lined copper cookware set. The main choices of lining are stainless steel and non-stick ceramic. Nonstick ceramic is great for easy cleanup, but as with much nonstick cookware, can have a tendency to chip. Also, make sure that the non-stick coating is free from any carcinogenic chemical such as PFOA and PTFE. Stainless steel, on the other hand, is durable and won’t chip or flake like non-stick. However, food has the potential to stick to stainless steel. Tin is also another choice in terms of lining, but not as popular since it wears out every few years and will need to be replaced. In terms of lifespan, stainless steel lining outdoes them all. There is one other option that appears on this list. Rather than a copper exterior, the ceramic lining of a pan can be infused with copper. What does this mean for you? It means the pan is nonstick, making it easy to cook with as well as easy to clean and maintain while getting benefits of cooking with copper. So now you know what makes copper cookware so superior and perhaps you’ve decided whether you want lined or bare copper. But are there any consideration when it comes to actually cook with it? Since copper is such a great heat conductor, keep in mind that when you change the temperature on the stove the pan will change fast! There is no need to preheat your pan before cooking. Food is less likely to stick to the pan since there won’t be any hot spots, but be sure to add oil or butter to stainless steel lined pans to prevent sticking. The best temp to cook at with copper is at a moderate temperature. No need to blast it to high! As mentioned before, keep acidic foods such as tomatoes and citrus away from solid copper pans. However, if you have a stainless steel lined copper pan, it is safe to cook acidic foods in it. The first thing you need to know when caring for copper cookware is to keep it out of the dishwasher. Dishwasher detergent is too harsh for copper and will discolor the cookware. Copper is hand wash only. Also, don’t let it air dry, as that can cause spots. Dry copper cookware with a soft cloth. Another thing to be aware of is copper will discolor with use. But don’t worry. You can get back that beautiful copper glow no problem. *Note: If the copper outside is a little worn looking, but the lining is fine, meaning no cracks and the copper isn’t exposed, then your cookware is completely safe to cook with. Polishing the copper is for aesthetic reasons. The easiest way is to purchase a polish specially made for copper. Copper polishes are easy to use. If you don’t have copper polish, don’t worry. There are many DIY options with ingredients you probably already have in your house that will help you get your copper cookware looking as good as new! Remove tarnished spots with lemon and salt or baking soda. Polish the pan or pot with a little white vinegar. Another option is to use ketchup or tomatoes. Allow the tomatoes to sit on it for a few minutes before washing off. Still not sure about cleaning your copper cookware? Check out this video to see how it’s done. Buying a set is a great way to save money. But what should your set include? First, consider what you plan to cook and how many people you are going to cook for. Are you a beginner cook cooking for two or an experienced home cook with a family of 4 or more? Are you a more adventurous chef who likes to cook a variety of food or do you like to stick with some basic tried and true staples? Most cookware sets come in either 6, 8 or 10 pieces. 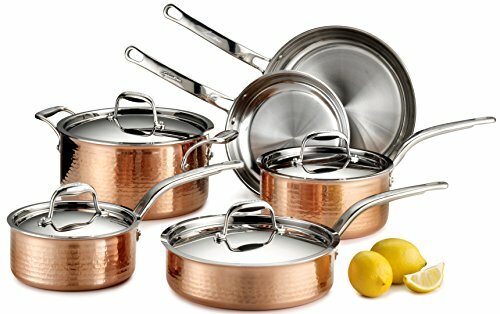 Most beginner cooks, those on a budget or those just looking to try out copper cookware should look for the 6 or 8 piece set. A small or medium saucepan. For small amounts of sauce and soup. A small and large skillet. For sautéing veggies, cooking meats and making an omelet. A large stockpot. For boiling water for pasta or potatoes or making a large amount of soup. A Dutch oven. Ability to go into the oven as well as the stovetop. Great for stews, soups, and roasts. Also, make sure the set comes with lids. Buying cookware is definitely an investment. This more so with copper. However, you will find many familiar brands on this list including Cuisinart, T-fal, and Calphalon, all of which are very affordable. Other brands such as Mauviel, Mafter, and Lagostina may not be familiar to you, and may also feature a higher price tag. But these brands have been around for some time and know a thing or two about quality cookware. All the hard work has been done for you though as we break down what copper cookware sets are the best and which one will work best for you. So without further ado, check out which copper cookware sets made the list! 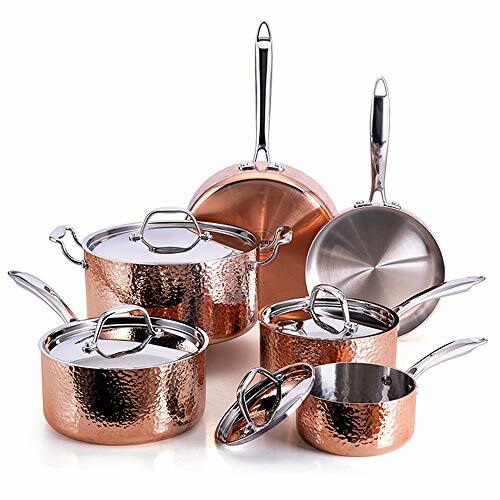 Stainless steel inside, attractive hammered copper outside and an aluminum core for fast, even cooking, this set is sure to please any copper-cookware lover! This set includes a 10” and 8” skillet and 2 quart, 3 quart and 6-quart pans. 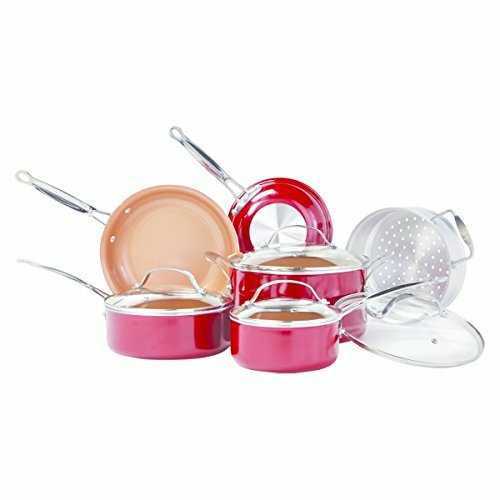 Each pan comes with a stainless steel lid that is also a stylish, functional touch. Do take note that if you want this beautiful set to remain beautiful it will require some TLC. If the copper begins to discolor, just follow their care instructions to get it back to looking as good as new. Simple, affordable, a set that covers all bases, this Calphalon set is a reliable and affordable copper cookware with no fancy designs, but still that copper cooking you are looking for. The brushed copper exterior and solid stainless steel lid give this set a more traditional look, but the brushed stainless steel interior makes it much easier to care for and cook with. The “stay-cool” steel handles and flared rims make handling and pouring a bit easier (and safer!) The lids fit snuggly on each of the pans for a solid seal. This set is super durable and will hold up to everyday use as long as you don’t mind hand washing these pans. The set comes with an 8” and 10” omelet pan, 3 quart and 6-quart saucepots with lids and 1.5 quart and 2.5-quart saucepans with lids as well. Not as heavy as expected. A little lighter than desired. This attractive set is going to cost a pretty penny, but it’s also going to last for a very long time. The heavy-duty cast iron handles and the thick red copper outside, stainless steel middle and red copper inside again is very durable, but as such, be sure to take care of it so it doesn’t lose that beautiful red copper color. This set comes with a casserole pot, saucepan, heavy sauté pan, flared sauté pan and lids for each. And these pans are heavy! The one thing that might prevent some from getting this set is the high price tag. Copper, in general, is a higher price, but this particular set… well, let’s just hope it does, in fact, last a lifetime. Beautiful red copper makes for an attractive set. Two layers of copper with stainless steel in the middle. If you are on a budget, this Cuisinart set is a good buy. This large set of copper cookware heats food evenly and quickly and won’t leave a huge dent in your wallet. The Tri-Ply of this set means copper, aluminum, and stainless steel are bonded together. The stainless steel inside also makes it easy to clean with a scouring pad if need be. It’s also nonreactive so you won’t need to worry about cooking certain acidic/reactive foods. This set is indeed a big one! It comes with a 1 quart, 2.5 quart and 4 quart all with lids as well as an 8” and 10” skillet and “the big one”— an 8-quart stock pot with lid. The whole set it oven safe up to 500 degrees. The downside is the bottom of the cookware, the copper fades over time exposing the stainless steel layer underneath. For the money and the way the copper evenly cooks food, it’s a pretty good deal. Stainless steel surface is nonreactive. The handle can get hot, so be careful! This is a top of the line copper cookware set. If you are serious about owning and using a copper cookware and aren’t worried about the price, this is the set. This gorgeous set features bronze handles and a copper shine you can see your face in. Something to note about the handles though— be sure to use pot holders as these handles do get hot! Unlike any of the other sets on this list, the lids are also copper. The copper is also very thick, coming at 2.5mm. So what do you get in this set? It comes with a 1.9 quart and 2.7-quart saucepans; a 3.2 quart sauté pan; and a 6.4-quart stockpot, all with lids. It also comes with a 10” skillet, no lid. All this comes with a price of course. But this pricey set will last so long, you’ll probably end up handing this down to the next cooking generation. Mauviel offers a lifetime warranty too. If you can afford it, this set is worth the splurge. Heats up fast, cooks evenly. Bronze handles can get hot. This 10 piece set is touted as being on Oprah’s “Favorite Things.” And it’s easy to see why. To start, this set comes with a lot of pans including an 8” and 9.5” fry pan, a 1 quart, 2 quart and 3-quart saucepan (each with lids) and the grand finale is the 5.75-quart dutch oven with you guessed it, a lid. You will have everything you need to get to cooking a feast with this cookware set. The stainless steel handles stayed cool and the aluminum core made for even cooking. If you are looking for a solid set, this ones definitely for you. Unique look. Could be a pro or a con, depending on taste. Won’t work on induction cooktops. Finally, a set for those looking for something that will work on induction cooktops! This 9-piece set not only comes with pans but with accessories to get you roasting and frying till your heart’s content. Be sure to wash with a soft sponge though. These pans aren’t good at rough scrubbing as the non-stick coating can flake. Comes with additional cooking accessories. Oven safe to 850 degrees. The non-stick coating can flake if washed with anything harsher than a soft sponge. This set is sure to stand out with its striking copper but simple design. It’s another non-stick ceramic-coated copper cookware set that is induction cooktop friendly and budget friendly. The only issue, albeit a big issue, if you are buying this set for an induction cooktop, is that the smallest saucepan didn’t work on the induction cooktop as stated. The set includes a 1.5-quart saucepan, 4-quart saucepan, a big ole 8.5-quart Dutch oven, and a 9.5” fry pan, all with covers. It’s a perfect starter set that will cover all bases. Non-stick coating makes for easy cleanup. Smallest saucepan didn’t work on an induction cooktop. Are you looking for something more budget friendly but want the benefits of cooking with copper? Then consider this T-fal cookware set. At first glance, it looks like a pretty standard stainless steel cookware set. What sets it apart is the copper bottom. The copper is part of a multi-layer bottom, helping the pan to heat up fast and distribute heat evenly. Two great aspects about this set you won’t see in many of the other sets on this list are it works on induction cooktops and it is dishwasher safe! There will also be no need to polish or maintain the copper unlike the others on this list. This set comes with an 8” and 10.5” fry pans, 12” fry pan with lid; 1 quart, 2 quart and 3-quart saucepan; and 5-quart pot with lid. The obvious drawback is that this set is just part copper. You won’t get that flashy, eye-catching look of a traditional copper cookware set. 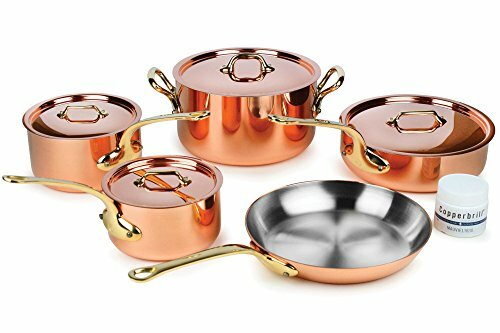 But if you just want to reap the benefits of cooking with copper without paying the higher price tag, this is a set worth considering. Heats up fast and cooks evenly. Less maintenance and care than all copper cookware. Won’t have that beautiful copper look. Copper-infused ceramic cookware is a great alternative because it provides you with the even heat distribution with an easy to use non-stick (and scratch resistant) surface. What’s even better is the low price tag. This 10-piece set comes with an 8” fry pan, 10” fry pan with cover, 1.5-, 2.5- and 6-quart pot with lid and as an added bonus an aluminum steamer insert. This is a surprisingly durable pan. The copper-infused ceramic coating is bonded to aluminum and does not chip. You will have to occasionally season the pan with oil. The bottom, however, does scratch up easily. And if you are looking for a true copper pan, this isn’t it. But if you are looking for cookware that makes good use of the benefits of copper, this is an affordable, easy to use cookware set. The nonstick surface makes for easy cooking and cleanup. You will need to occasionally season the pan. The red exterior on the bottom can scratch and chip. Q: Can copper cookware go in the oven? A: Yes! Copper cookware can withstand the high temps of an oven. However, be sure to check the manufacturer’s instructions to see what temp it is good too. Copper pots with tin are good up to 325 degrees, whereas most copper pans lined with stainless steel can go up to 500 degrees. Q: Why can’t copper cookware go into the dishwasher? A: Putting your copper cookware in the dishwasher will discolor your lovely set. Dishwasher detergents are harsh on metal, so copper cookware, as with many other types of cookware, should be hand washed only. If you love that beautiful copper color and want it to last, keep it out of the dishwasher. Q: What is Tri-ply copper cookware? A: Tri-ply is a term used to described cookware that is made of three layers. The layers are usually copper, aluminum and stainless steel. Both the copper and aluminum heat the pan fast and evenly where the stainless steel is durable and easy to cook on. Q: Is using copper cookware harmful? A: The short answer is it depends. Copper cookware that is lined with stainless steel or another material is not harmful to your health. And while solid copper cookware is generally safe, copper can leach into foods and too much copper in your diet is not a good thing. If you do decide to purchase solid copper cookware, beware of the risk. For those who go with lined, you have nothing to worry about. Q: Is copper cookware really worth the price? A: If you love to cook and are looking for a cookware set that lasts a long, long time then the answer would be a definite yes. 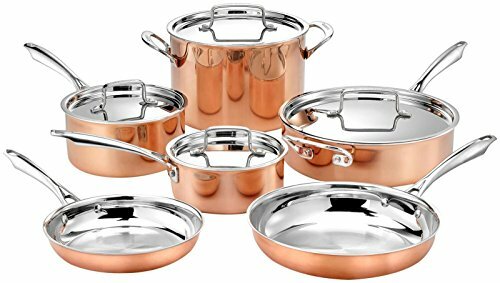 However, if you still aren’t sure, choosing an affordable set that includes copper in the design but isn’t made entirely of copper, like the T-fal stainless steel copper bottom set, might be the way to go. Cooking enthusiasts gravitate towards copper cookware for good reason. While copper cookware can be a serious investment, fortunately, there are plenty of sets that are affordable. But don’t write off those sets with a higher price tag. They will last you a lifetime and even beyond. These beautiful sets may even be handed down to generations to come. Copper cookware isn’t just for the professionals either. A misconception is that copper is hard to maintain and cook with, but in fact, it is quite the opposite. If you love to cook, copper is a great addition to your kitchen. For those looking to go all the way and really treat themselves to the best copper cookware, the Mauviel M’heritage is a fabulous cookware set that will last a lifetime. 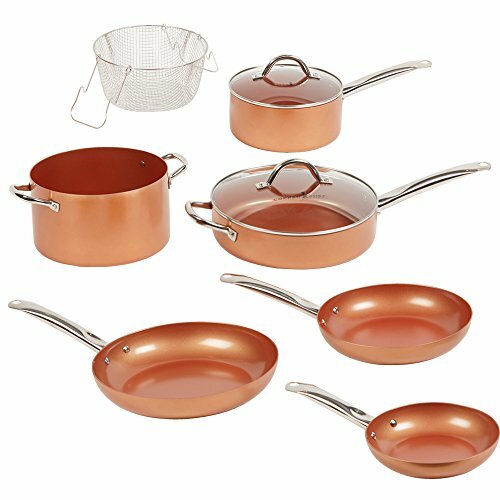 But if you aren’t ready to make that sort of commitment, the Copper Chef set is also a great more affordable choice.